Finally, it is here, your wedding day. Everyone you love arrives to share the day with you, putting a warm feeling in your heart and a smile on your face. Your dress dances in the wind, making you look even more beautiful. Your hair is perfect. Your shoes are shining and everything worked out just as you were hoping. The ceremony is full of life and hope for the future. Family and friends gather to celebrate all the love that fills the room. There are tears, laughter, applause and that overwhelming feeling of happiness. The joy you felt for your partner for so long has now crystallized. Cheerful congratulations and celebrations spill through the air late into the night. There is food, wine, and a stunning cake. This is the day you have been waiting for. It is everything you have ever dreamed of. And when the magic has settled and you look at the photos that captured all those wondrous moments, you will be instantly brought back to that perfect day. Your wedding is truly a memory that will last a lifetime. We provide an array of packages. We are flexible and can set up a customized package that fits your needs and budget. call us on +46703885043(SWE) +64 220 399 889 (NZ) or use our contact form. Fill in your information below and we will contact you as soon as possible. What do our couples say about us? Susanne and Fredrik came all the way to the middle of nowhere- a rural town in the state of Missouri, to photograph our wedding. It was cold, and rainy, and the landscape offered little inspiration other than the novelty of its bleakness. And we couldn't be happier with how our photos came out. As a team, Susanne and Fredrik work like magic together. Everywhere they went, they scanned for potential shoot possibilities. They thought ahead and made effective plans concerning lighting, social arrangements, timing, and even my and my husband's mood/attitude. They used their imaginations to tackle problems before they ruined anything, and were always prepared. Their positive, easy-to-work-with personalities created an atmosphere where my husband and I and my guests were completely at ease being photographed by them. 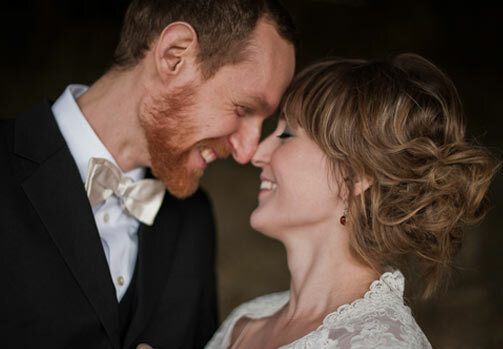 We highly recommend booking them to photograph your day. After some days with hard winds and rain, on the morning of the 6th of October we opened our eyes to a calm and sunny Visby. It was such a joy. For once we had managed to gather all people important to us, friends and family all together in one place for a whole weekend. For us it was important that the wedding would feel like our wedding, that it reflected our personalities. We didn’t want a stiff traditional wedding but a more relaxed atmosphere with focus on the party, love and our guests. And that’s exactly how it happened. The best thing about our wedding day is that we have so many beautiful photos from it, and they will always be with us. 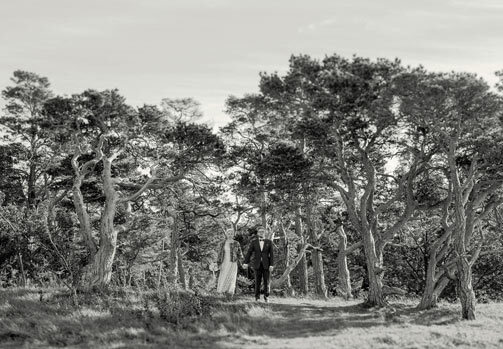 Spending the whole day before the ceremony with our photographers, Susanne & Fredrik, made it even more special and memorable. With their commitment and flexibility we could not have wished for any better photographers. When we started talking about the look of our wedding Oscar wanted it to be elegant and I wanted something rustic and romantic. So we decided to mix both themes. As a result we handmade a lot of the different details ourselves, it was really fun but a little bit stressful from time to time. Our fantastic photographers Susanne and Fredrik followed us for the whole day and it felt like having an extra friend around. They gave us a lot of support and tips when needed and they were incredibly creative, engaged and focused on doing a good job. They even brought fruit and candy for us so we wouldn't get a sugar low during the day. So professional and lovely at the same time! 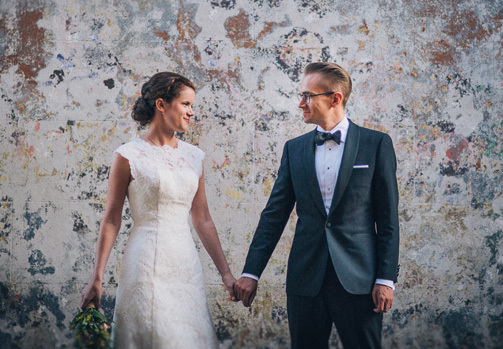 In September 2013 we realized a dream we have had for years – to exchange vows in the Swedish Church in New York. Thanks to Susanne and Fredrik, we have amazing pictures from throughout the whole day. 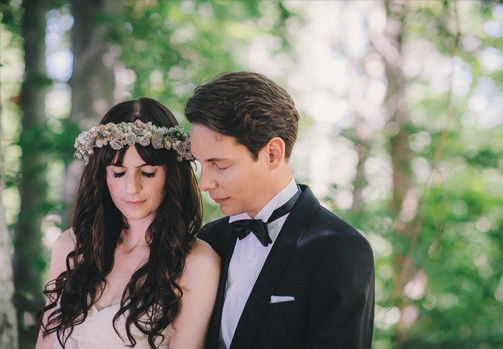 We strongly recommend Axel & Berg if you seek professional photographers for your wedding day. Their attention to detail and lighting will make you feel like models, which is nice. However, what really sets them apart from the rest is their ability to capture the really important moments.